During their most recent fiscal report, Nintendo said that Nintendo Labo has been shipped off to a number of schools. Classrooms have been interacting with the kits and using them to supplement standard teachings. It seems that bringing Nintendo's unique Toy-Cons into the classroom has been a rousing success for both teachers and students alike. Mr. Vacca's comments echo that of many other teachers who have seen their students take to Nintendo Labo unlike anything else. These Toy-Con kits are bringing classrooms together, and teaching children how to really work with one another. If you have a couple of minutes, make sure you check out the full feature here to get a real idea of just how well Nintendo Labo in the classroom is working out. 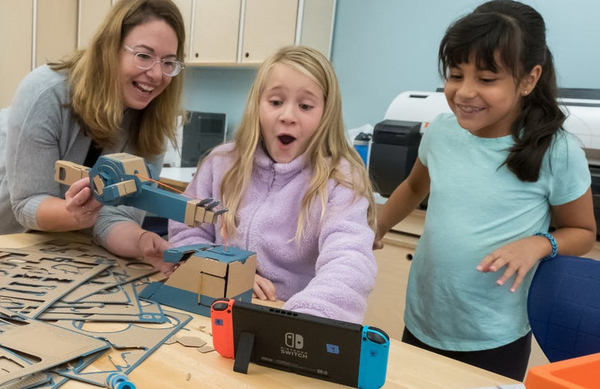 I knew when they first revealed Labo that it shouldn&apos;t be treated like a game, it&apos;s an educational tool which encourages creativity in children. It&apos;s good to see that it has found its market and is being warmly received. I remember a certain individual in the comment section insisted that Labo simply wouldn&apos;t work in the classroom because it was too fragile and too expensive. He completely ignored the fact that Nintendo achieved the same type of success in the classroom with the DS and now again with LABO.